Discover Santa Cruz during your price guaranteed Bolivia vacation. All of our Bolivia tours have daily departures and are fully customizable. Santa Cruz de la Sierra, in the huge eastern lowlands of Bolivia, could not be farther, geographically or figuratively, from the Altiplano. At a height of just 1,365 feet above sea level (416 meters), the city has a tropical climate and ambiance and is characterized by lush vegetation. 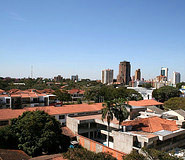 As one of the largest cities in Bolivia, it has rapidly become a hub of economic growth. Swift economic development has engendered a youthful energy, which coexists wonderfully with the charming colonial character of the old city center and its back streets. Santa Cruz mainly attracts visitors due to its international airport and its train connection (tren de los muertos) for onward travel to Brazil. Also, the nearby Amboró National Park and the city of Samaipata (with the pre-Columbian fortress 'El Fuerte') are touted destinations for top Bolivia tours. On a trip through Bolivia that covers all of the country’s highlights, Santa Cruz provides a relieving retreat from high-altitude cities and a modern atmosphere that is as vibrant as it is laidback. Santa Cruz attractions. When you explore this sprawling city, you may be surprised by its modernity. Start at Plaza 24 de Septiembre, the city’s main square around which the first city streets were constructed and the first houses erected. Here you’ll also find the massive Basilica Menor de San Lorenzo, the brick and limestone cathedral – from the bell tower, you can obtain great views of the sprawling city below. Right behind the cathedral is Manzana Uno, a block dedicated to art and cultural exhibitions, and at La Recova, on Calle Libertad y Florida you can appreciate more Bolivian artisanal goods. Parque El Arenal, a favorite city park among locals, boasts a small lagoon, a famous mural by Lorgio Vaca, and the interesting Museo Etno-Folklórico de Santa Cruz, with displays of traditional art. Just outside of town, Santa Cruz has a plethora of family-friendly sites, including botanical gardens and theme parks, as well as opportunities for extreme sports. Among these are the La Lomas de Arena (sand dunes), Zoologico de Fauna Sudamerica Noel Kempff Mercado, the Biocentro Güemes y Parque Ivaga Guazú, and Aqualand and Playland, the largest entertainment parks of their kind in Bolivia. Jesuit Missions. Rising from deep in the Bolivian jungle near Santa Cruz, the curious religious-architectural jewels remain as evidence of a heavy 17th century Jesuit missionary presence. The architecture of the missions is a perfect example of the blending of European and native elements. 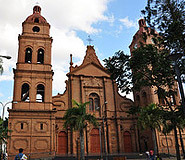 The missions, which have been declared UNESCO World Heritage Sites, can be visited as a circuit and are a popular option for Santa Cruz tours. 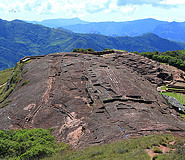 Samaipata. Situated at the crossroads of the Andes and Amazon, the mountains and valleys of Samaipata are characterized by gorgeous landscapes, rich biodiversity, and a deep historical and archaeological heritage. The main attraction is “El Fuerte” (The Fort), a huge, intricately-carved stone outcrop used by both pre-Inca and Inca cultures. From Samaipata, you can detour to see the giant fern forests of Amboró National Park. Longer multi-day treks into the biologically-rich national park can also be organized. Thanks to its low-lying location, Santa Cruz enjoys a semi-tropical climate with an annual average temperature of 73°F. Rainfall is heaviest in January and February, and those interested in visiting the nearby national parks should be aware that the rivers rise dramatically during this period and there are significantly more mosquitoes. Santa Cruz also experiences dramatic cold wind patterns (surazos) that swoop in from Argentina and can suddenly drop temperatures by up to 30 degrees F, though the fronts only last a few days at a time. All types of accommodations are available in Santa Cruz. One of the best hotels in town is the hotel Los Tabijos, which has everything you would expect from a 5-star hotel, including a swimming pool, lush gardens, and 184 rooms all with balconies. Contact a Latin America For Less Travel Advisor for more information.